The following Reports and Forecasts are available only to MHEDA members. Not a member? Find out more about the Benefits of MHEDA Membership and Join Today! 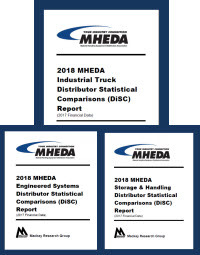 MHEDA’s DiSC Report is a financial benchmarking study that annually provides key insights into exactly how the “high-profit firms” generate better profit numbers. It focuses intently on the three profit drivers: growth, gross margin and expenses. The report, available for Industrial Truck and Storage & Handling/Engineered Systems, provides clear evidence as to how small differences in a few areas translate directly into higher levels of profitability. The DiSC Report is a summary of dealer member financial data presented in tables and graphs designed to provide a comprehensive guide for analyzing profitability (individual responses are kept strictly confidential). Purchase 2018 Report Results (requires member login). The report contains detailed reviews of distributor executive and employee compensation and benefit programs including salaries, bonuses and perks. Volume 1 – results compiled directly from MHEDA members comparing compensation levels for employees. This section includes job titles that apply only to MHEDA members. Volume 2 – titled The Cross Industry Report and compares compensation levels from nearly 2,000 firms in the distribution industry. Purchase the report (requires member login). MHEDA has partnered with ITR Economics on a new economic report designed specifically for MHEDA Members. This detailed report features material handling industry specific data. The report will be available quarterly in: January, April, July and October. Our goal is to provide you a usable tool to assist in your business planning. ITR Economics has a 94.7% forecast accuracy that will allow you to plan with confidence, becoming proactive to coming economic forces rather than reactive. Access to this report is FREE to MHEDA Members – a $15,500 value if you were to purchase this report on your own! Order and Download the reports (requires member login). If you have trouble logging in to download or purchase the reports, contact us at 847-680-3500 or email connect@mheda.org for assistance.